A GObject interface (which GStreamer uses) is a set of functions that an element can implement. If it does, then it is said to support that particular interface. For example, video sinks usually create their own windows to display video, but, if they are also capable of rendering to an external window, they can choose to implement the GstVideoOverlay interface and provide functions to specify this external window. From the application developer point of view, if a certain interface is supported, you can use it and forget about which kind of element is implementing it. Moreover, if you are using playbin, it will automatically expose some of the interfaces supported by its internal elements: You can use your interface functions directly on playbin without knowing who is implementing them! /* This function is called when the GUI toolkit creates the physical window that will hold the video. 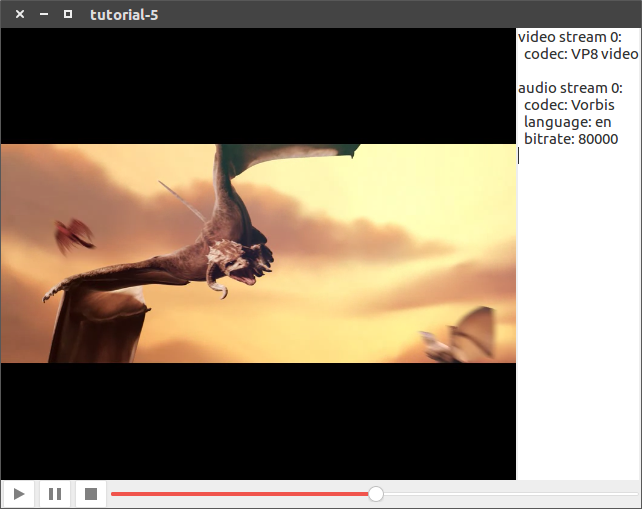 /* Cairo is a 2D graphics library which we use here to clean the video window. /* This function is called when an End-Of-Stream message is posted on the bus. /* This function is called when an "application" message is posted on the bus.